ArtStation Masterclasses offer a unique opportunity for artists around the world to have access to exclusive lectures by top artists in the entertainment industry and interact with them directly online. With one ticket, you’ll have access to all 10 courses and instructors. From now until the the event begins in March, we’ll be releasing an exclusive interview with one of the all-star instructors every week. 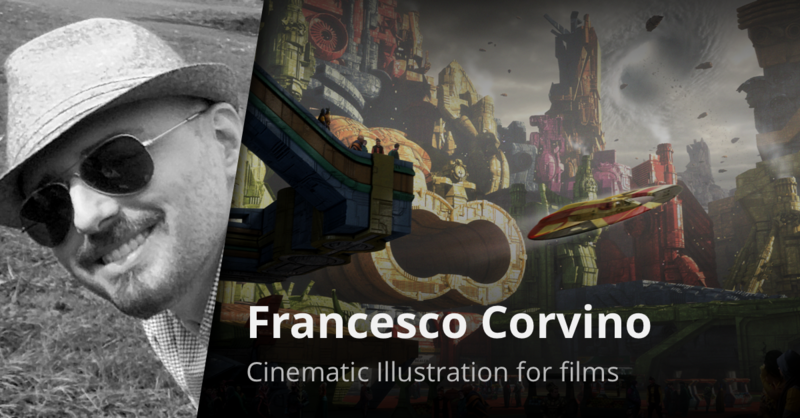 This week we’re chatting with Concept Artist and Architect Francesco Corvino whose passion for architecture, movies and storytelling is the main force behind his visionary style. His work in film includes credits on Thor Ragnarok, Fantastic Beasts, The Martian, Game of Thrones, Birdman, Teenage Mutant Ninja Turtles, Maleficent, and World War Z, just to name a few. Storytelling, mood, composition, and ultimately the Director’s vision, are the essential elements that any successful concept artist must translate on the canvas quickly and effectively. Starting from the initial brief all the way to the final touch-ups, Francesco Corvino shows his daily routine to create compelling images for the film industry. How did your background in architecture transition to a career in concept art? I’ve always been attracted by visionary architects like Piranesi, Boullee, Sant’Elia and Speer. While studying architecture at University, I spent a lot of time sketching cities and buildings that seemed to belong more to a Sci-Fi movie than to the architectural design we see everyday while walking in the streets. My wife was the first one to make the connection, and she suggested I could use my passion not only in Architecture but also in the Film industry. I chose the Gnomon School to specialize in the field and that gave me the extra tools I needed to fully shape my skill set and set foot in the Industry. Today I keep doing what I loved doing at University: imagining how Architecture and Urban Development could be in the future, in other worlds, or how it could have been in a past we know very little about. Tell us about one of the most valuable things you’ve learned on the job. I’ll give you the one piece of advice I really deem essential for any artist, which is also the one that took me the longest to learn. Be yourself. On your long journey you’ll experience disappointments, you’ll feel utterly discouraged and above all, you’ll see other artists blossoming all around you, creating incredible things in innovative, original ways. Look around you to learn how you can improve your art, but then go ahead your own way and develop art that is truly representative of who you are and how you see the world. Avoid the urge to copy trends, or making things just for the sake of being appreciated by those around you. You’ll just end up being the pale copy of somebody else, and that guy will always be better at being himself than you’ll ever be. Strive to show to the world the unique artist and individual you already are, even if it means swimming against the tide. Know who you are and what you want to accomplish. When I learnt this lesson, I finally felt truly free and accomplished. What’s one thing that students in your Masterclass can expect to learn? I’ll show you an example of what the job of a concept artist truly entails in our day by day routine. The creative flow while working at the director’s side is quick, organic, constantly changing and chaotic at times. In one day, you’ll try several ideas, maybe just rough sketches. One minute you’re pushing an idea to completion, the next you’re going back with the director to the drawing board. In a similar scenario, time and flexibility are very precious and being bogged down by using complex pipelines or by refining small details is a risk to be avoided at all costs. After all these years in the field, I learnt that some of the most effective artists are the ones who keep it simple and concentrate on storytelling, composition, lighting and all the cinematic fundamentals that so potently speak to a director and the audience. As the great architect Mies van der Rohe used to say, “less is more”. In this Masterclass I’ll show you how to use a handful of simple, powerful tools to come up with a solid illustration that honours the brief and the Director’s vision. What’s something about working in the film industry that you think most people don’t know? When you’re looking at the Film Industry from the outside and you’re trying to break in as a Concept Artist, I think it is understandably hard to clearly know what the job is really all about. I’m not crazy about the “concept artist” title, because it means nothing really, and it poorly describes what we do. When you’re called on production as a concept artist, you’re essentially a designer, somebody who brings a creative input to the table. If the design is already there, they’ll call an illustrator. You should never lose sight of this. Designing is why you’ve been hired in the first place. The director wants your creative contribution, not just an illustration, no matter how beautiful this is. This means going through a design process that goes way beyond the act of creating a compelling image. It means you’ll have to spend a lot of your time doing research, collecting references, throwing ideas around. The images you’ll create are just a mean to an end, not a goal in itself so don’t get fond of them. You’ll probably have to quickly disregard them and come up with something different. They can be rough, even horrible, but if they sell a solid design, job done. To sum things up, before you do anything, ask yourself what do you really want to do? What is it about concept art that makes you tick? Is it the act of designing, or the process itself? Ask other experienced concept designers about what they do and what their day-by-day routine entails. This will help you to be more aware of what you’re really getting into and take a more conscious decision. Find out more about ArtStation MasterClasses and save $80 when you buy your ticket before January 31!